Evie Rafalko McNulty, the Lackawanna County recorder of deeds, says she would support Scranton native Joe Biden if he were to run for president in 2020. 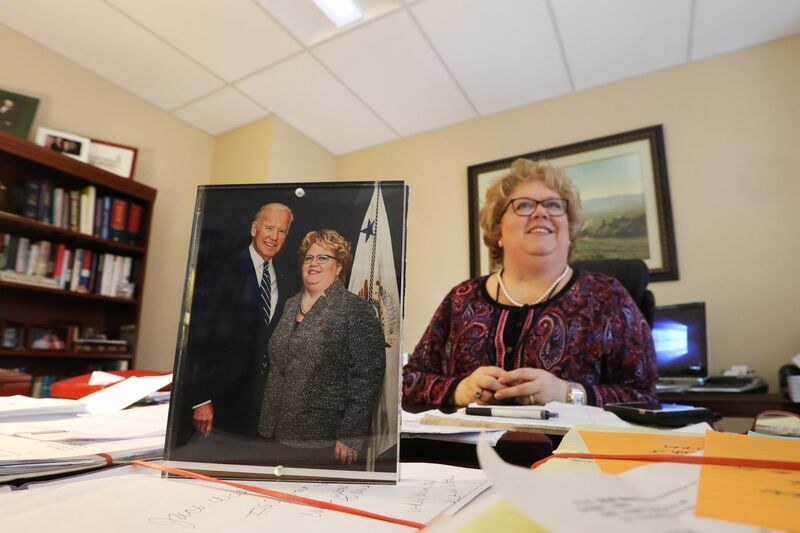 SCRANTON — There may be no bigger supporter of Joe Biden than Evie Rafalko McNulty, a local officeholder and longtime family friend who remembers getting a consolation call from the vice president of the United States when her husband died from cancer in 2016. She’s thrilled about the prospect of a Biden candidacy in 2020. But she worries about “Joey Biden,” the 76-year-old who proudly calls this former industrial city of 78,000 people his hometown. “When you talk about Biden in Scranton, you talk about him running for president, people will say, ‘Can his family go through all this, and will his age be a factor?’ And it’s not because of the office he’s choosing. It’s because we care about him, his health,” said McNulty, the recorder of deeds for Lackawanna County and a member of the Democratic National Committee. As Biden considers another run for president, some in Scranton who have ties to the family or who grew up nearby say they feel protective of their native son, expressing concern about the toll of another campaign. And, like Democrats across the country, others are torn between their admiration of a man they know to be decent and qualified, and a desire to see a new generation of leaders who look more like the diverse electorate. A Biden candidacy would almost certainly dredge up ghosts of the past, from his support for controversial 1990s-era crime laws to his handling of Senate hearings on Anita Hill’s accusations of sexual harassment against Supreme Court nominee Clarence Thomas. That baggage suggests the former vice president may be out of place amid resurgent debates about mass incarceration, race, and sexism. This pre-primary anguish is vexing Scranton as the Democratic Party weighs how best to challenge President Donald Trump, who sealed his Electoral College victory in 2016 in part by winning over white working-class voters in Pennsylvania, Michigan, and Wisconsin. Former Vice President Joe Biden, pictured here in October, is weighing another run for president. One debate consuming the party is whether Democrats should focus on winning back those working-class voters — a strategy that would argue in favor of Biden — or double-down on the liberal insurgency that fueled inspiring, if unsuccessful, statewide 2018 campaigns by candidates like Stacey Abrams in Georgia and Beto O’Rourke in Texas. Northeast Pennsylvania — a favorite spot to visit for politicians who want to burnish their credentials as regular human beings — is an important piece of the puzzle: Trump flipped two counties, nearby Luzerne and another in the Lehigh Valley, that Barack Obama had carried in 2012; he also closed the margin here in Lackawanna County. Democrats up and down the ballot performed well in the region in last year’s midterm elections, suggesting it may not be a Trump stronghold. Biden, who has run for president twice before, is expected to make a decision in the coming weeks. CNN reported Friday that Democrats consider him “likely” to run. He leads in early polling among Democratic voters in Iowa, which holds the first-in-the-nation caucuses, and last month he said he was “the most qualified person in the country to” occupy the office. He and Trump have mused about literally fighting each other. Biden lived in the city’s Green Ridge neighborhood until he was 10, when his father moved the family to Wilmington, where he worked for a heating and cooling company. While Biden was a Delaware senator, he was often referred to as Pennsylvania’s third senator. Ask around Scranton about Biden, and residents are quick to point out that he doesn’t just return during election years. They recall his trips for Fourth of July and St. Patrick’s Day, among other occasions. Judges and Scranton-area socialites joined the lunchtime crowd at P.J. Scanlan’s, a few blocks from the Steamtown Mall, a nod to the coal-fired locomotives and rail lines of the city’s history. Scranton’s still the “Electric City,” or so the skyline sign says, but it’s added modern touches: the vegan cafe downtown, for example. At Scanlan’s, famous for its home fries with gravy, people on Wednesday spoke fondly of the former vice president and shared favorite Biden stories. Laurie Cadden, 57, said her son graduated from Penn in the same class as Biden’s granddaughter, and the two families sat near each other during the 2016 ceremony. Cadden said she would be behind Biden 100 percent if he were to run. “There’s not one person who’s said to me, ‘I don’t think he should do it.’ Not that everybody’s saying, oh he should. But nobody’s saying he shouldn’t,” she said. Laurie Cadden, speaking with a reporter during lunch at P.J. Scanlan's restaurant in Scranton, said of a prospective Biden candidacy: “There’s not one person who’s said to me, ‘I don’t think he should do it.’"
“A younger candidate might fare better, like Kamala Harris,” he said, referring to the California senator. Of course, there’s no consensus yet on who that person will be. And whatever appeal Biden may have in working-class areas like Scranton, some residents are clamoring for a younger leader. She, too, had her Biden stories, and recalled how the vice president maintained a lifelong friendship with one of her husband’s coworkers, a warehouseman. “I think that we do need young, fresh blood. We need energy, we need new ideas,” said Donly, a social worker who voted for Bernie Sanders in the 2016 primary and mentioned Sens. Cory Booker and Amy Klobuchar as possible nominees this time around. Living in Scranton makes the 2020 calculus especially difficult, she said. “We have a hometown boy. We want to throw him up on our shoulder like the quarterback after a winning game,” Donly said. But she said she isn’t sure Biden would be a viable candidate who could unite the country, and the stakes are too high to take any chances. READ MORE: Will standing alone help Cory Booker stand out in a crowded presidential field? Biden considered running in 2016, too, but ultimately decided against it as he grieved the death of his son Beau. Some of the vice president’s supporters here can’t help but think Biden would have saved the country from Trump. They take solace, in part, in the idea that he could be the one to stop him — so long as he’s up for the task. Tom Bell, a lifelong friend who grew up with Biden in Scranton, said the former vice president hinted at a possible run when they spoke over the phone the other day. “I said: ‘Joe, let’s face it, I too am 76. My pitches are hitting the dirt before they’re going over home plate,’ ” said Bell, who voted for Trump and called Biden the only Democrat who could beat the president.